Graham Russell & Russell Hitchcock met on May 12, 1975, the first day of rehearsals for “Jesus Christ Superstar” in Sydney, Australia; they became instant friends with their common love for The Beatles and, of course, singing. In 1989, they recorded “The Earth Is” album selling over a million copies outside of the U.S. This album was followed by “The Vanishing Race” CD and, with the singles “Goodbye” and “It’s Never Too Late”, again saw multi-platinum success. The following albums, “News from Nowhere”, “Yours Truly”, and “Across the Concrete Sky” all gave their second greatest hits album multi-platinum status as they traveled the world each and every year. 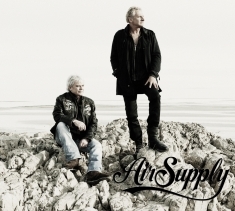 In 2000, a new production company was founded to be devoted to Air Supply’s entire future product, called A Nice Pear, which gave them complete creative control. In July 2005, their live DVD, “It Was 30 Years Ago Today” celebrated 30 years of success around the world and in that same month, Air Supply smashed attendance records when, in Cuba, at one show they played to 175,000 people. Also 2005 saw the release of “The Singer and the Song”, an acoustic album of many of their big hits which received critical acclaim. Certificate recognizing 3 million performances of the duo’s hit “All Out Of Love,” Air Supply’s new song was the #1 most added track on the FMQB AC40 Chart, and also one of the most added on the R&R (Radio and Records) AC Chart and the Mediabase AC chart. The band recently released its live Jerusalem show for a new DVD featuring two new songs, “Sanctuary” and “Everywhere.” “Sanctuary” was released as a single on iTunes in December 2011. On October 13, 2012 the iconic duo will be inducted as the latest honoree in Gray Line New York’s prestigious Ride of Fame campaign, the premier double-decker bus, motorcoach and entertainment company’s new program designed to recognize and honor leading New Yorkers and iconic New York establishments. The company bestows a bus in their fleet to each honoree they identify as an exemplary community figure.